Since bloom made the mesh for teenagers after my request, I decided to made some recolors. 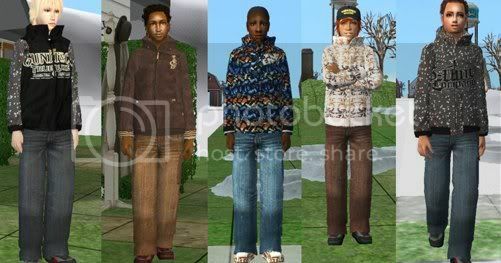 These are recolors of Maxis outerwear (but for boys), so bloom converted to teen male. You will need this mesh to see on your game. The mesh is not included. These outfits require Seasons EP. Bloom -thanks to let me use your mesh. Great work, Nyane! You are so good @ this! These are great, my boys don't have enough clothes, as I really appreciate it! Thank you my teen males need more clothes..
Sweeeet! ...I'd type something more but my eyes are currently fixated on that one with the black jacket. Awesome! Thank you soo much!!! Awesome recolors! !